Recommended to: Readers looking for a unique read that blends the science fiction, dystopian fiction and elements of the paranormal. Samantha Durante's novel moved to the top of my reading list as soon as I read the synopsis. 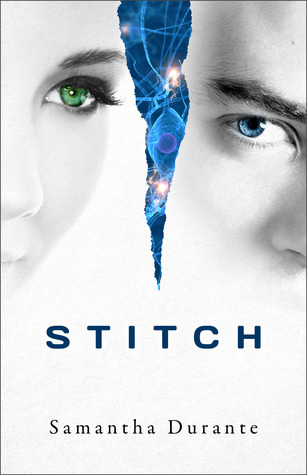 Stitch sounded like a great combination of genres. Something fresh and new! For those of you out there who are constantly reading like I am, you know the lure of anything that sounds unique. I was eager to see where Alessa's story would take me. Let's start with what I liked about Stitch. First off, I really did love the story line. Well thought out, Alessa's story is definitely different than any that I've read before. I'm not entirely sure how to praise it without giving too much away. What I can say is that the statement that it bridges paranormal romance and dystopian sci-fi is spot on. Alessa's life isn't what it seems. No matter how flawed she might feel her existence is, nothing can prepare her for what she discovers about her past. The other thing that I enjoyed were the way that flashbacks were incorporated into the story. As Alessa's story progresses, and she uncovers more about herself, the reader gets to see into the memories that were suppressed These flashbacks were my favorite part of Stitch. The first half of the story moves fairly slowly as the reader is introduced to the important parts of Alessa's current life. It isn't until her flashbacks start occurring that things get really interesting. This is where the dystopian element comes through, and it is fascinating. Sadly, although I did finish the book, I also did a lot of skimming while reading. Written in third person, Alessa's story felt detached to me. I really wanted to see inside her head, rather than just hearing what she was doing. There was ample telling, but not as much showing. As a result, I never really got to know Alessa, Janie or any of the other characters as well as I would have liked. I couldn't connect with them. Mid-way through the book things really picked up, but by that point I still wasn't invested in Alessa's struggle. I definitely loved the premise of Stitch and, even if I didn't fall completely in love, I also think that it is a very unique story. Readers who are looking for something different, something fresh, will find a lot to love in this book. I am happy to say that I read the sneak peek to the next book in this series and it looks great! Despite any qualms I may have had, I know that I'll be back for more of Alessa's story. With the ending such as it is, I have a definite need to know what happens next.